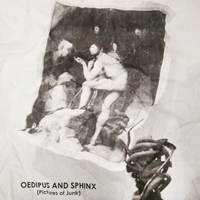 INVISIBLE-EXPORTS is pleased to present OEDIPUS AND SPHINX (Pictures of Junk), an exhibition featuring work by Vik Muniz and the Philadelphia Wireman. The cerebral iconoclastic Brazilian-born multimedia appropriation artist Vik Muniz has spent two decades reinterpreting and re-contextualizing touchstones of the Western canon by recreating them with unfamiliar, surprising, and often undignified materials — food, cotton balls, garbage, dirt, and toys – in an ongoing effort to interrogate authorship and representation. In the work presented here, Oedipus and Sphinx (Pictures of Junk), Muniz reproduced Jean Auguste Dominique Ingres’ exalted painting Oedipus and the Sphinx (1808) with materials sourced from a junkyard in a favela outside of Sao Paolo. Both works depict Oedipus, the great icon of hubris and human ignorance, at the moment he solves the “riddle” that had so long stymied his countrymen, redefining the terms of the puzzle (“What animal walks with four legs in the morning, two in the afternoon, and three in the evening?”) not as a meditation on everyday life but as a reflection on eternity and posterity (his answer is man, who progresses from infancy to adulthood and cane-assisted old age). Muniz’s practice is clearly steeped in a deep knowledge of art history, a skilled manipulation of contemporary conceptual ideas, and a successful participation in the upper echelons of the global art market. The Philadelphia Wireman is perhaps the purest example of the artistic archetype of Outsider — not just overlooked by and disengaged from the art world of his time, but completely unknown, even after his death and the discovery of his work, except by the objects themselves. Those works — sculptural collages, which enclose found elements within bundled wraps of steel wire — were discovered in the late 1970s on a Philadelphia street within a pile meant for trash pick-up. It is not known when the works were made (though some elements contained within the work suggest the 1970s) or where, or by whom, though because of where they were discovered, many believe the sculptor to be an African-American working- class man with ready professional access to heavy-gauge wire-working tools. And yet, despite their being produced in obscurity, the works exhibit all the hallmarks of a rigorous and conscientious art practice. Special thanks to Yasaman and Vuk Djunic, and Lucas Ajemian.